How long should my child ride rear-facing? Rear facing is not just for babies! The American Academy of Pediatrics (AAP) has long recommended that―infants ride in rear-facing car seats, and in 2018 the AAP updated that recommendation to encourage rear facing for as long as possible, until a child reaches the highest weight or height allowed by the manufacturer. 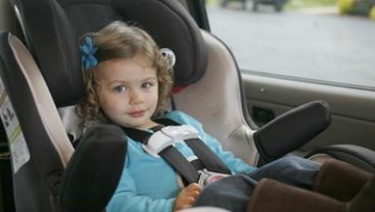 Most convertible car safety seats have limits that will permit children to ride rear-facing past the second birthday. This recommendation was based not only on motor vehicle crashes in which children died or were injured, but also from what we know about the anatomy of young children. Young children have large heads compared to their body size, and a high center of gravity. The vertebrae in their spine are more shallow, and their ligaments are looser. All of these factors increase the risk of a spine injury in a crash. In a sudden, violent stop, a rear-facing seat will cradle a child's entire back and spread out the force of the crash, reducing the risk of serious injuries to the neck and spine. Children in other countries routinely ride rear-facing until age 4. Deaths and serious injuries to these children are extremely rare. While differences in car seats, vehicles, and driving conditions make it tricky to compare, data from those countries suggest that children in the U.S. are also best protected by riding rear-facing for as long as they can. Over the years, car seat manufacturers have increased the weight and height limits on their rear-facing seats. This means that more children can ride rear-facing as they grow well into the toddler and preschool years. No matter which direction your child faces in the car, though, it is important to read and follow the instructions from your car seat manufacturer. A certified child passenger safety technician can help you figure out what is best for your child and your vehicle. Find one online from the National Highway Traffic Safety Administration or Safe Kids Worldwide.